More space for guest kitchen would be better.. I wish and my family will stay again.. The hotel is located at very convenient place and the staff also really helpful. everything is perfect for me and & that friendly environment feels me comfortable. Since it is in a transport hub you can get international buses also to travel through Europe. Very pleased with this place. A little far from city centre not really walking distance. But the trains are right beside the place. Very good breakfast for what you pay. Bar could of had a little more selection for food. But over all I felt like I was in a very nice hotel. Super quiet. 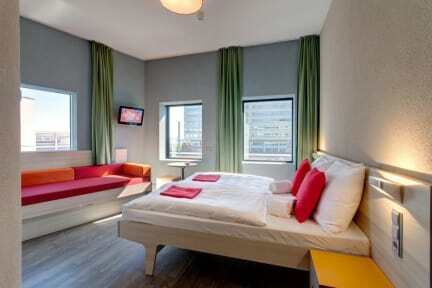 The hostel is in a great location next to Sloterdijk station. The lounge area was big with a few activities to do. The rooms were clean and the staff was very helpful and knowledgeable. There are lockers in the room but I could not fit my bag in the ones in my room. There are also lockers in the lobby. Overall the stay was good and I would stay here again. Lovely place, but not much of a hostel atmosphere. Was packed with large groups and families, felt like a hotel. Super clean though, with big bathrooms and comfortable beds. The hostel itself is amazing, very clean and new. The staff however aren’t friendly and some were quite rude. We had a flight cancellation and landed a day late, despite letting the hostel know prior they had given our room away and didn’t make it easy to find us a new room. This was very disappointing. The Hotel is located a little out of the city but right at a train station. 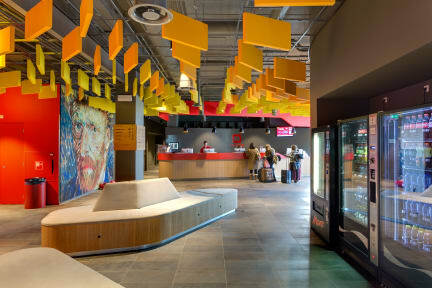 I loved the location and the hotel was clean but overall it is way too overpriced, even for Amsterdam. We paid 300 Euro/night for a 3 person bedroom overlooking the rails and hearing a train every ten minutes. That is way too much. And then they wanted 8 Euros for lugagge storage.